So if you’re reading this, then you may have noticed that there have been quite a few changes around here! One MASSIVE change is that I finally made the decision to take my site in a direction that will give the freedom to follow my creativity. You are no longer visiting ChrystalDesigns.com! Instead I'm giving you a BIG warm welcome to StephanieChrystal.com! Re-vamping my site and re-creating my vision has taken a lot of hard work and it has definitely had it’s up and down. It took a great deal of thought, battling through fear and insecurity to get to this point. And you want to know something? I love it! It was all worth it and I’m SO proud of myself for getting here! I’m sharing this because maybe you're struggling with the same things. Maybe you're where I was a few months ago. Feeling lost and confused. Beating yourself up for not being further ahead. Being afraid of failure. Being afraid of success. Choosing to block it out because that's easier than facing the idea of getting out of your comfort zone. You know what I've learned? That each moment that you experience, whether good or bad, will help you to be unique in the end. What you’re trying to do, putting yourself out there, it’s hard! Sometimes social media can make it seem as if everyone is succeeding and having an easy time doing it. But that is not the reality! The truth is only a small percentage of the internet population is actually succeeding! The rest are watching and hoping but aren't actually taking any steps to make it a reality. Most give up or just don’t bother to start. But you know what? You’re not one of them! The fact that you’re even trying is something that you should be so proud of! Trying and not giving up is the first step. Want to know another important lesson I learnt from this re-branding experience? It's okay to give yourself permission to change your mind! Changing your mind doesn’t make you a failure. Instead, it makes you an innovator. This is what led me to decide not only switch to StephanieChrystal.com but also to hire the help and skill set I didn’t have to get my branding to match my vision (I'll be sharing more details on my decision in an upcoming newsletter so click here if you don't want to miss it). The key point here is I gave myself permission to change my mind, to be flexible and to follow my instincts. When I launched ChrystalDesigns.com, my goal was to design and sell a planner. The purpose was to create a tool to help girl bosses both in the online and the corporate world find balance. Well if you've been following me you know that this didn’t happen, and that made me feel like a failure. And to add insult to injury I was often mistaken for a website designer! Now don't get me wrong there is nothing wrong with being a web designer. I can only imagine all the creativity and hard work needed to run a web designing business. I mean sometimes I find it hard enough maintaining my own site and I use SquareSpace! I definitely don’t have the skill-set to be a web designer and would never promote myself as one. And that was the problem. Being mistaken for a web designer made me feel like even more of a failure. It meant that my message and my branding was confusing my followers. So when the idea to go from Chrystal Designs to Stephanie Chrystal popped into my head I resisted. Not sticking with the original name felt as if I would be adding yet another failure to what seemed like an already growing list. When I finally did give myself permission to change my mind I also chose to give myself the option of flexibility. I'm a firm believer in the saying "Your dream job does not exist. You must create it". So what is the point of creating your dream job if you don't give yourself the space to try out new things? To follow your instincts? To be creative? Wasn't that the whole appeal of doing all this hard work? By changing my site to Stephanie Chrystal I was owning my business and realizing that I had permission to trust my instincts and be creative. When it comes to my career I love helping people but I also love challenging my mind. Now I can. figure out what works for you? I’m in love with the new colours, fonts and the over all look and feel of the new Stephanie Chrystal branding. But re-branding isn’t just about the style of your business but also the vibe. Figuring out my brand words and how I want my followers to feel when they arrive on my site was vital. In my personal life I'm a very caring and supportive person. I love helping the people I care about to succeed and making them smile. I want that to show in my business. I want people to feel welcomed and not judged; that they’re are somewhere where they can find kindness and support mixed in with a few laughs. Does your brand reflect your values and personality? It should because you're amazing! Consistency. That is my goal. I don't know about you, but almost every single webinar, course or masterclass I've attended has spoken about the importance of being consistent. I'm not talking about frequency but rather providing quality content on regular basis. As you probably know, this isn't always easy when working a day-job and running a side hustle. Trust me I get it! So what's the solution? It's creating consistency that works for you. While working on the new branding I also took the time to really evaluate what I could realistically stick with and what works with my schedule and my priorities. After all this is MY business no? Isn't that part of what giving yourself permission to be flexible is all about? It's okay to follow your gut instinct and go against what other online entrepreneurs say is the "right"thing to do. It's not to say that their advice isn't valid but what is the point if it's going to discourage you and make you feel as if you're failing? Instead do what is right for you! It's your business after all! And if you don't want to miss any of the juicy details on what steps you need to take to get your business organized and how to find a semblance of balance simply fill out the form below! 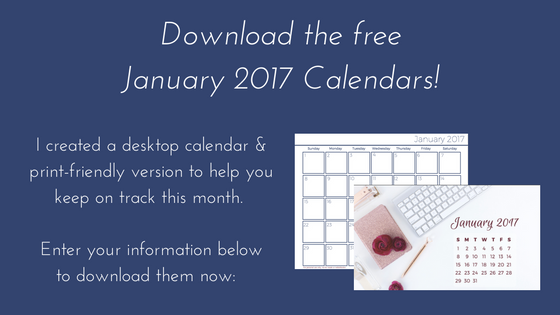 Bonus : you'll receive free calendars to help you plan 2017! Awesome content & support right in your inbox! Get your free calendars here! Thank you! Your free download is on it's way to your inbox right now. The main goal of my blog is to inspire you to move forward! To take the next step whether it's big or small. I mean each and every one of us needs support! We all need encouragement for those days when we ask ourselves "should I keep going?" That's what I want to do. I want to support and encourage you to keep going. I want to build a community that genuinely supports one another. A community that share similar goals, is transparent, open-minded and who is not afraid to lend a helping hand. Part of that encouragement is going to come from engaging with you one-on-one on social media so make sure your following me on Instagram, Facebook and Twitter! Struggling with something? Feeling discouraged? Just need someone run an idea past? Send me a message and I'd be happy to try and help! No strings attached! That's what support one-another looks like! My goal is to work with people that I can truly support. Personally, I love the idea of finding other creatives that I connect with and can feel excited about helping them to make their dreams and projects a reality. Recently I decided to use my 6 years of experience as an executive assistant and coordinator in the private, public, and wedding industry to help other creative entrepreneurs. It has always driven me crazy how we have been brought up in a society that often insists that your suppose to use the first 65+ years of your life to working hard and giving your best to a company in order to follow your passions and dreams when you final retire and don’t have the same energy levels. My vision with having my own business is to support other female entrepreneurs to achieve their goals that will allow them the flexibility to be able to prioritize the important things in their lives - loved ones, careers, spirituality and their passions. I’m so incredibly happy to introduce you to something I’ve been really working hard on and for a long time was hesitant to share with the internet world. I humbly invite you and hope you'll check out the details here. Feel free to send me an email if you have questions! My mission is to help you go after your business goals so that you have more time and energy what you love for living while having the flexibility to focus on the important things in life. Now don't get me wrong my goal here is to build community. I don't want to just work with anyone. I want to work with people who although may be feeling overwhelmed they are passionate and excited to move their dreams forward but need help in moving their projects forward and knowing what to delegate. Not sure if your at that point in your business where you should be a hiring a virtual assistant or project manager? Have questions about what it’s like to work with a VA? No worries I've got you covered! Just click here and let's have a virtual coffee date together! We can chat and see if it's something you maybe only in need in the future. My goal is to support you so if expanding your team is not right for step for you now I have no problem saying that. * tons of content, tips and freebies to help you move your projects and dreams forward! And remember, just because I’m recommending a tool or system doesn’t mean that you HAVE to use it! Cause it may not your work style and that’s okay! Don’t get overwhelmed like I did with all the tools and strategies available out there. For a long time I was paralyzed by information overload. The key is to help you figure out what works for you! It's to inspire you to move forward and help you take the next step you, whether it’s big or small. So go ahead, take away from what I share what works for you and will help you grow. And if you’re not sure how to? Just reach out to me here and I would be happy to help! And to celebrate and to help you start fresh in 2017 I’ve created a little set of calendars to keep you on track! I don’t know about you, but I can’t ever seem to have too many calendars. Your free calendars are heading to your inbox to right now. I hope you’ll join me!! Leave a comment below and let know : what you think of the new brand?